The show is cleverly put together. The history is traced like the seasons—when the word Spring appears on the overhead screen (along with comic book sketches) the group is just getting started. When Summer arrives, they are hot and in their heyday. Then comes Fall, where financial troubles and personal squabbles take over. Then Winter: as the group ages, they are finally reunited at the Rock & Roll Hall of Fame. We are told in the beginning of the show that if you asked each member of the Four Seasons about their rise to fame, each would have a different story. And that’s what we get—as the seasons change, a different member of the group takes over as narrator. And each Jersey Boy has a different perspective on how they became chart toppers of early American rock and roll. We hear all the favourites, including Big Girls Don’t Cry , Walk Like a Man , Rag Doll , Can’t Take My Eyes Off of You , and many more. Matthew Dailey is the bad boy Tommy DeVito. Dailey sings like a dream, while giving us Tommy’s ruthlessness. Keith Hines plays Nick Massi, the deep voiced singer in the quartet, who silently puts up with Tommy until one day he blows up. Hayden Milanes is Frankie Valli, singing all the hits perfectly, flipping from his smooth belt to the trademark high falsetto. Drew Seeley plays Bob Gaudio, the talented song-writer of the group. The ever-popular December, 1963 , better known as Oh, What a Night , is the autobiographical account of Gaudio’s, uh…, first time. We had the pleasure of meeting the three female cast members prior to the show: Marlana Dunn plays the tough Mary Delgado, Frankie’s first wife; Jaycie Dotin plays Lorraine, the reporter that Frankie falls for; and Leslie Rochette plays Francine, Frankie’s daughter. But in addition to those key roles, the three young women play a total of 49 additional roles. Each of these Jersey girls has 15 or 16 costume changes; in fact Dunn has to completely change costume, wig and footwear in 8 seconds, which she does every night with help from the wardrobe crew. It was great fun to see a couple of familiar faces in the cast. London hometown boy Jonny Wexler plays Joe Pesci, the Jersey punk who goes on to win an Oscar. Wexler is well-known to Drayton audiences as Peter Pan, and for his appearance in High School Musical . At the Grand, he was in A Wonderful Life , and if you have kids in your household, you’ll recognize him as TV’s orange Doodlebop. Also on stage in several roles was Dance Captain Bryan Hindle, who was part of the Canadian cast of the Toronto Jersey Boys . Hindle will be familiar to Toronto audiences for his roles in War Horse , Dirty Dancing , We Will Rock You , and more. Director Des McAnuff has ensured the show never lags, with tight, fast scene changes. In fact, the narrator is telling the next story before the final notes of the last song die off. Credit goes to choreographer Serge Trujillo for the perfect moves that keep the familiar tunes very lively. Jersey Boys is the best of the jukebox musicals—if you’re a fan of shows like Buddy: The Buddy Holly Story or tribute shows, then you’ll love the Jersey Boys . Tickets are still available for this brief stop in London. 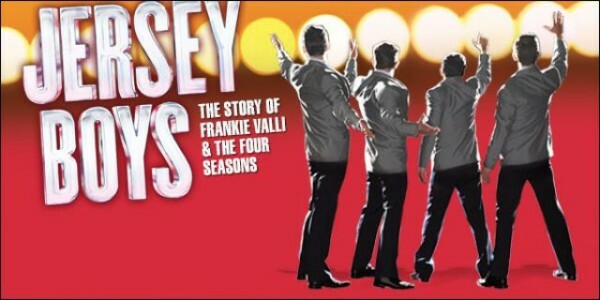 Jersey Boys continues until February 15 at Budweiser Gardens. Call the box office at 1-866-455-2849 or visit www.budweisergardens.com.